Joe Haden injured his hip in Sunday's loss to the Bears, but practiced for the first time on Friday and could play against the Jets. BEREA, Ohio (AP) –– Browns cornerback Joe Haden hopes to deliver Rex Ryan a lump of coal on Sunday. Haden returned to practice Friday after missing two days with a bruised hip and said he may play in Sunday’s game against the New York Jets. On a conference call earlier this week, Ryan, the Jets’ loquacious coach, praised the talented Haden as a "rare guy" and joked that one of the items on his Christmas list was for the cornerback to miss this week’s game. "Man, I’m Bad Santa," Haden cracked. Haden was limited to riding a stationary bike on Thursday, but he was back on the field Friday and looked to be himself while doing sprints and drills during the portion of practice open to reporters. Haden was injured last week against Chicago when he was hit in the hip by Chicago tackle Jermon Bushrod’s knee while trying to make a tackle on a running play. Haden, arguably Cleveland’s best defensive player, will likely be a game-time decision. Of course, he wants to play. "If it was up to me, I’m always going to ball," he said. "That’s what I want to do. I want to play. Let’s put it there. I want to play, for sure." Haden is having a Pro Bowl-worthy season for the Browns (4-10), who have dropped five straight and eight of nine. 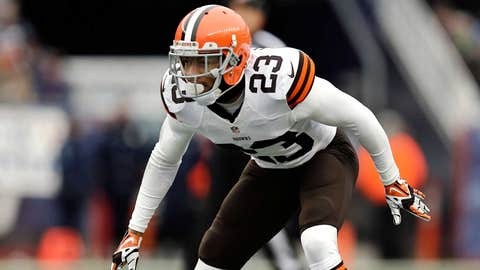 Although Haden has given up some big plays in Cleveland’s past three losses, Browns defensive coordinator Ray Horton believes the fourth-year cornerback, who has been assigned to cover the opposition’s top receiver every week, has played at a consistent, elite level. "When you look at the body of his work, he’s had a fantastic year," Horton said. The Browns will be without starting tight end Jordan Cameron on Sunday as he remains sidelined with a concussion. Cameron, who leads the Browns with 75 receptions, was also injured at some point late in the loss to the Bears. He’s following the NFL’s guidelines on head injuries and must be cleared by an independent neurologist before he can play. Also wide receiver Davone Bess missed his second straight day for personal reasons. Browns coach Rob Chudzinski said he should know on Saturday whether Bess will travel with the team. As the Browns went through final preparations for Sunday’s game, a voice from their past was still making noise. Jets tight end Kellen Winslow, who began his pro career with the Browns, got some attention in Cleveland’s locker room when he said his former team doesn’t have anyone who can cover him. The remarks are typical Winslow — brash and boastful. "He’s thought that for years," said Chudzinski, who coached Winslow in Cleveland. "That’s the confidence that you want football players to have." Haden wasn’t surprised by Winslow’s claim. "I saw it. It’s funny," Haden said. "What would you all expect him to say? You want him to say, `Yeah, man, those dudes up there are going to cover me?’" I don’t really know him that well, but just hearing of his personality, that sounds like the kind of guy that that’s what he’ll say. It is what it is. On Sunday after the game, then we’ll be able to figure out if we were able to guard him, if we weren’t able to guard him. "So no matter what we say now, it won’t matter."